KRION®’s invitation to EXPOCAMACOL, the international construction, architecture and design trade fair. KRION® will be present at EXPOCAMACOL, the international construction, architecture and design trade fair and one of the most important trade fairs held in Colombia. 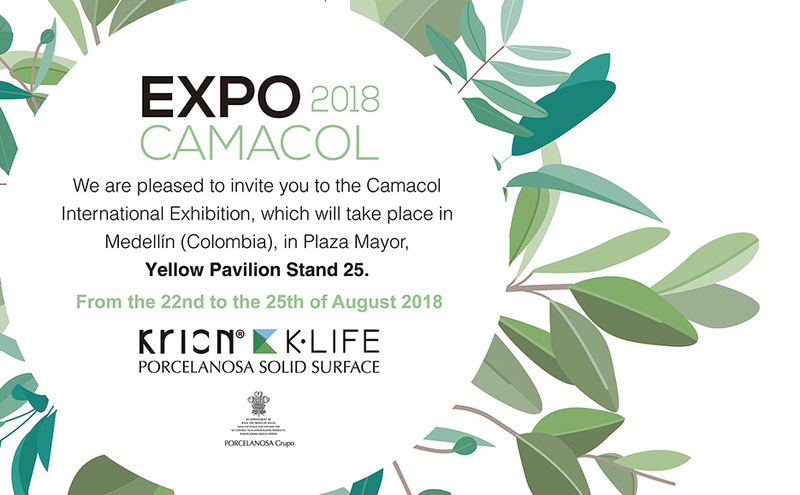 From the 22nd to the 25th of August 2018, EXPOCAMACOL will be the setting for trade, new products and business for the construction industry, where business and professional sectors from around the world will meet. At stand 25 (Yellow Pavilion) KRION® will present all of its excellent properties, such as its high fire resistance and great capacity for thermoforming, allowing unrestricted designs. Additionally, K·LIFE, the new revolution within the world of solid surface, will present all the beneficial properties of the material which help to improve the quality of the air we breathe. The K·LIFE sensory experience will be displayed at the stand so that anyone attending the trade fair can discover the powerful characteristics of the compact mineral.